In Office 2011 for Mac, the default Outlook Identity is called Main Identity, but the application allows more than one. 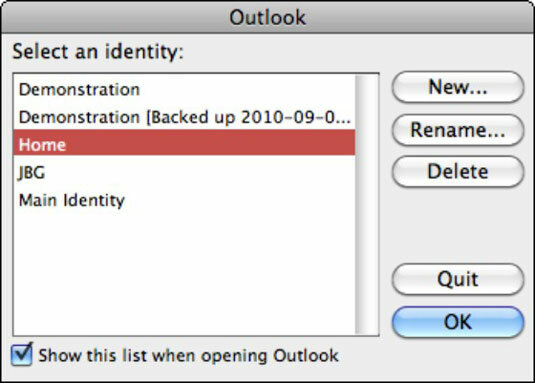 Outlook 2011 for Mac gives you some tools to help you manage your Identities. Only one Identity at a time can display in Outlook. Quit Outlook (pressing Command-Q quits any application). Run the Microsoft Database Utility. Change the default Outlook Identity. Click the red close window button in the upper-left corner of the Utility window to quit the Database Utility. In Finder, open your Microsoft Office 2011 Identities folder. Change the name of the folder of your default Outlook Identity. Select the Show This List When Opening Outlook check box. Be sure to select the Show This List When Opening Outlook check box. It’s a handy tool for switching Identities instead of using the Database Utility. You can then choose the Identity you want to use and click OK without having to open the Database Utility.